I forgot about this recipe. 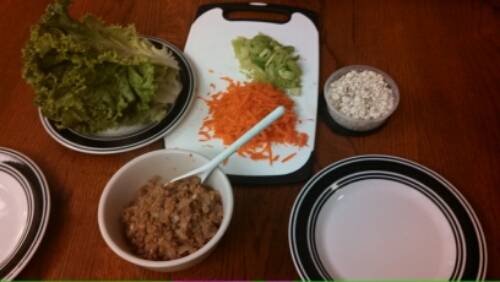 I had been trying to get my blog updated, and somehow overlooked this delicious and simple Buffalo Wing Turkey Lettuce Wrap recipe by The Girl Who Ate Everything. Honestly, there’s not a lot to say about this dish. It’s delicious. It’s simple. It’s fairly healthy. Not to mention, I am pretty sure that I’ve never had a bad experience with The Girl Who Ate Everything’s recipes! The recipe calls for blue cheese dressing or blue cheese crumbles. I used crumbles, but I think having a dressing would make it a bit more zesty and less dry. But either way – it was good! Another side note is that I did not use iceburg lettuce, as the recipe calls for. I know a lot of the lettuce cup recipes call for iceburg, but it’s hard for me to justify – if I’m having a healthy dinner, I’d prefer a higher nutritional content! I ended up using green leaf lettuce, which is not the most cup-esque of leafy greens, but it still did the trick! -In a large skillet, saute the onions over medium heat until soft (3-4 minutes). Add garlic and cook for 1 more minute. Add ground turkey, season with a dash of salt and pepper, brown meat and cook until cooked through. Drain any grease if necessary. -Return meat to pan and stir in the wing sauce. Reduce heat to low and simmer for a couple of minutes. 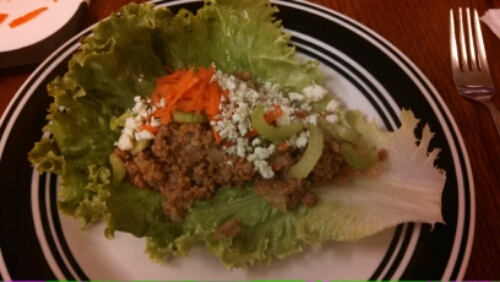 -Prepare lettuce cups. 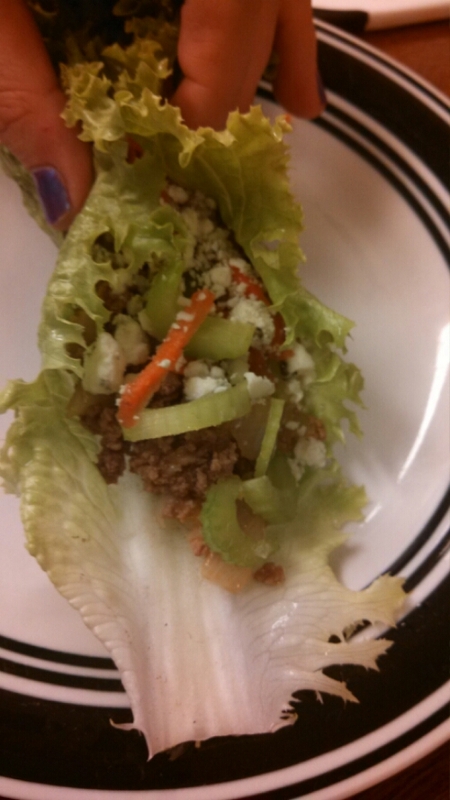 Place spoonful of meat into lettuce cup, top with carrot shavings and chopped celery. Sprinkle with some blue cheese crumbles and/or dressing. Wrap up and eat.